The Hermitage is one of the oldest and the largest museums in the world. It was founded in 1764 by Catherine the Great and open to the public in 1852. Nowadays the collection of the Hermitage museum includes more than three million works of art and artifacts of the world culture. Paintings, graphic works, sculptures and works of the applied arts, archaeological finds and numismatic material are among them. One whole day is not even enough to see the half of the rich collections. 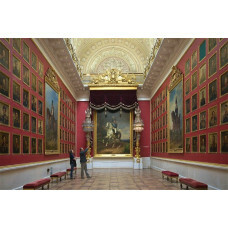 During our tour you will visit the splendid Gala Rooms of the Winter Palace and the collection of Western European art, which is regarded as one of the finest in the world. The collection includes numerous works by outstanding masters from Italy, Spain, Holland, Flanders, France, England, Germany During the tour you will see splendid Gala Rooms of the Winter Palace which was the main residence of Russian Emperors and Empesses and see the masterpiecies of Western European art collections of the Hermitage museum.